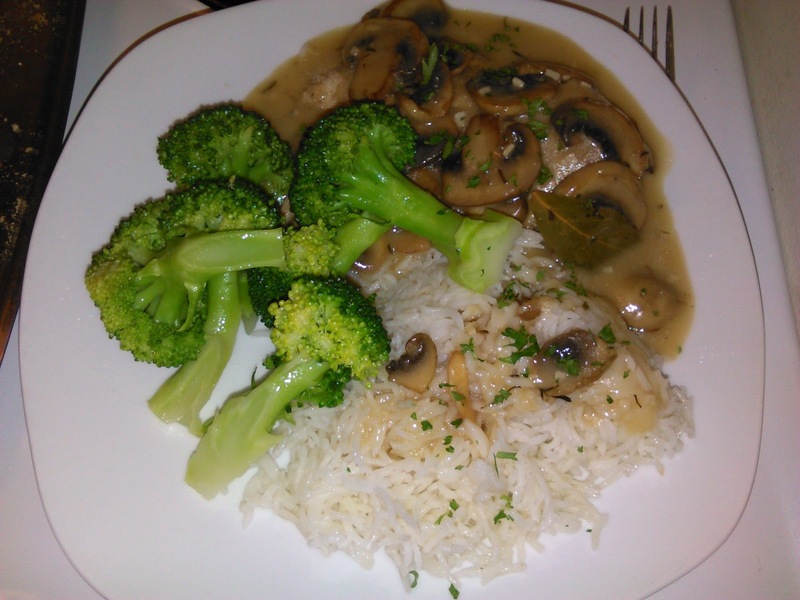 Fern requested chicken with mushroom white wine sauce so I paired that with broccoli and basmati rice. Mine is completely submerged but there is a breaded chicken breast under all that sauce. All I did was put 1/4 cup bread crumbs in a plastic bag with 1/2 tsp salt 1/2 tsp poultry seasoning and fresh ground mixed pepper. I shook the breasts in the bag, laid them on a baking sheet and put them in the oven for 20 minutes at 325F. They were a bit small so took 5 minutes less time than usual. The rice was done in the microwave with salt, olive oil and a few drops of lemon juice. I also put a few drops of lemon on the broccoli, which was steamed, cooled and reheated in olive oil. For the sauce I seared 5 sliced mushrooms with some fresh crushed garlic. When the mushrooms had a sear I sprinkled two teaspoons of flour over all. I stirred that in and let the flour taste cook off most of the dish. Then I turned off the heat and whisked in a cup and a half of white wine. Turn the heat back on and bring to a simmer. Turning off the heat while adding the liquid usually avoids lumps. It needed half a cup of milk too. It still needed something, I added a teaspoon of chicken stock powder and that filled out the flavour. I let it simmer till it was reduced by about a third, maybe a little more. I added salt, pepper and 1/2 a teaspoon of thyme. Fern doesn't like anything on his rice so there was sauce left in the pot. After dinner Fern got mad at me for not putting the excess sauce on his rice because it was really delicious. I really can't win.